Today’s shop update day, at long last. I’ve got hand-dyed Sock, Fat Sock, and giant skeins of superwash DK yarns, plus Wensleydale, Falklands wool, and Merino/mohair spinning fibers. Sarah from Maisy Day Handsun sent Merino sock yarn and some lovely handspun. Shop here at 2 pm EST. Look at it all on Flickr. 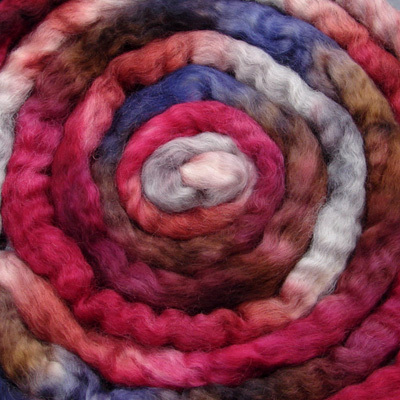 Renewal memberships for the Fiber Club will go up for sale on the 25th, and any slots left over will be for sale starting January 30th. I’ll remind everyone here again before the day. New, hopeful members, be forewarned that slots sell out within a matter of hours. Go here for more info. I haven’t made any changes to the club since last time. Same price, same amounts of fiber. I just found your site. Very nice! I love the Inga hat and will be making one soon. I enjoyed your movie list(I own a Video Shop) and I wanted to recommend the movie The World’s Fastest Indian. It is one of the best from 2006 and looking at your movie choices I think you’ll like it! Do your updates EVER last more than a couple of hours? Amazing lady. Bit late to the party, but I just wanted to say that your Inga hats are incredible! Just found your site and from the sounds of it. . .I will have to check it hourly! LOL Lovely hats!